Officers were honoured for their commitment to bring offenders for robberies and financial crimes to justice at the annual Canadian Association of Chiefs of Police conference in Halifax. It’s not often that bank robbers fire off rounds during a hold-up. When it happened on two occasions within a month in late 2017, Toronto Police Hold Up officers knew they had to get the suspects off the street before someone was seriously injured or killed. On November 2017, a suspect robbed the CIBC branch at Victoria Park Ave. and Ellesmere Rd. During the robbery, he discharged a round in the floor and fragments hit a bank employee in the leg. On December 19, 2017, the same suspect hooked up with another individual to rob a CIBC bank in Brampton. Again, he discharged a round into the floor, but no one was injured. His co-accused stood guard as a lookout at the bank entrance while the robbery took place. About five hours later, the two men were apprehended by police. Hold Up, which played a major role in the investigation that resulted in the arrest, was presented with a Group Award on August 14 by the Canadian Bankers Association at the CACP annual conference. Detectives Steve Campbell and Paul Mills collected the award on behalf of their team. Campbell said the robberies were unusual because of the willingness to put people in danger. Two loaded firearms were recovered and over 40 charges were laid against the two accused dubbed The Mercedes Bandits because the main accused used a 2010 Silver Mercedes in both robberies. He pled guilty and was sentenced to 12 years. The co-accused also pled guilty and received a six-year sentence. 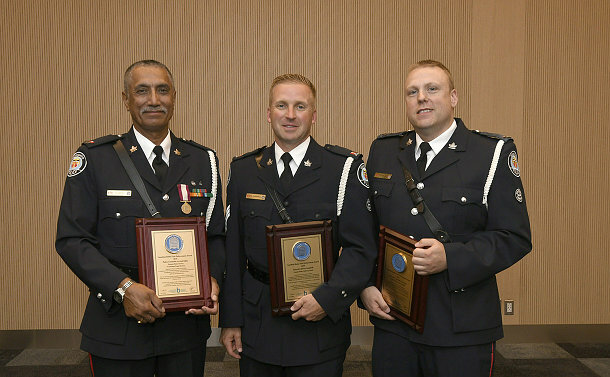 Constable Arvind Sidhu, now a 22 Division Community Response Unit officer, was presented with the CBA Individual Award. In late 2016 while at 23 Division, he started an investigation to catch a criminal who had fraudulently applied and used over half-a-dozen credit cards from a number of banks across the country. Through identify theft, forgery and an elaborate network of mail forwarding and false addresses, he maxed out each card with a loss of nearly $100,000. Though Sidhu’s diligent investigation resulted in an arrest, the officer continued to pursue the case on his own time even after being re-assigned to other duties. His thoroughness in following up yielded a connection to several other cases, revealing that the perpetrator had an extensive criminal history in the United States dating back to 1988, with financial fraud in excess of $1 million. The suspect was convicted of several serious criminal offences and sentenced to a period of incarceration in addition to a lengthy term of probation for each charge. His refugee status was revoked and he’s currently in immigration custody awaiting deportation to Nigeria. “When I heard everything this officer had done and the lengths to which he had gone to turn over every investigative lead, I was very impressed,” said Superintendent Scott Baptist, the Traffic Operations unit commander, who attended the Halifax conference.